Many medical students lose the love of reading during medical school. This loss of passion is probably related to the massive quantity of medical books and journal articles that we are forced to read every day. It’s hard enough to come home after a 12-hour clinic shift and still read/review for 1-2 hours, not to mention adding even more time for pleasure reading. Binge watching your favorite series on Netflix is much more alluring to most people than diving into War and Peace. Before medical school, I was an avid reader. Over the course of a given year, I would probably average one book a week (unless I happened to pick up a 1000 page tome). Although I initially tried to keep reading during medical school, most of my reading time had to be dedicated to medical books, text books, and journal articles. There are dozens of posts online asking about what to read during medical school, and I’ve been asked multiple times for recommendations. Most medical students want to stay far away from anything even remotely resembling medical books, while others are looking for something to reignite their motivation in the clinic. Like batman, sometimes the book you need is not necessarily the book you deserve (or think you want), and I have been surprised multiple times over the last four years by what books have had a large impact on my life. However, in-between semesters and on lighter clinical rotations, I was still able to sneak in a novel or two (actually more like 15-20) into the lineup. My interests have evolved from pure literature, to science fiction/fantasy, and now mostly non-fiction books. Some books were perfect for the lull after Step 1, and some I had wished I read earlier. I’ve found that WHEN you read a book is often as important as WHAT you read. You may have heard of this book, as it is very popular for people looking to advance their career or become better managers of people. The book itself is well written, and gives pretty common sense advice: actively listen to people, don’t complain, etc. Despite being somewhat predictable, the writer gives great examples and really brings these values to the forefront. I actually listened to this as an audio book during two very long drives in the middle of my fourth year of medical school and wished I had read it right before starting my rotations. How to Win Friends and Influence People gives perfect advice for medical students in the clinic. Our evaluations are almost 100% subjective, and the difference between a Pass and High Pass (or even Honors) can boil down to how likable you are. I’ve found that by simply thinking about some of the suggestions in the book, I’ve felt some interactions going much more smoothly. In fact, I plan to write up a more in-depth review of it and how it pertains to medical school later (it’s that good). This is another book you may recognize (or at least you’ll recognize the author). Atul Gawande’s books are well known to almost everyone in the medical community, and he’s enjoyed some moderate fame for his work on checklists and other public health measures. I’ll admit that I find some of his writing to be a little too emotional for what I expect from a data driven book. But otherwise, the books are phenomenal. Better focuses on the process of improvement. Specifically, Gawande highlights how skill can influence patient care. After reading this book I was highly motivated to do everything better. I focused on improving my hand washing, knot tying, and how well I did lung and heart exams. It was just what I needed to get back into the groove after a week of night shifts on a hard surgical rotation. This book should be required of all students entering fourth year. At this point in your training, you can start to contribute to the team. You will get to do more procedures, your presentations will carry more weight, and the residents will start to trust you. Third year was a time to focus on survival. Fourth year is your time to start honing your skills, and to relentlessly practice the basics. Better will help you do just that. This book has become a cliche, and is on almost every must read list. You’ve probably heard residents or medical students using words like “Gomers” or “Turfing”, which were popularized in this book. If you haven’t read it, you should probably just bite the bullet and get it over with so you can be in the know. Although it has many hilarious moments, House of God is a 100% brutally honest look at intern year (the first year of training after medical school). There is no sugar coating in this book, which I find to be one of its biggest strengths. For this reason, I would recommend reading the House of God in the last few weeks of 4th year as you prepare for residency. At least after reading you cannot say that nobody warned you. Yes, I realize that these are two very different books with two very different perspectives. However, the spirit behind them (at least for our purposes as medical students/residents) is similar enough. Both Machiavelli and Sun Tzu write about victory, whether as a ruler or military commander. Although I would obviously recommend reading both, it’s probably sufficient to read either one. Both books are on the shorter side, so it shouldn't be too painful. I read these books during 4th year, but again wish I had read them earlier. The sense of purpose and determination I felt after reading the Prince and Art of War would have helped me stay motivated during the long study hours of my preclinical years. Read one or both of these during your first year summer to get ready to conquer Step I. This is the autobiography of a neurosurgery resident who gets diagnosed with Stage IV Lung cancer. The writing is passionate, and I was devastated by the end. There is something about being a soon to be resident when reading this book that makes it feel very real. I’m not going to suggest a time frame to read this book, because I think it would be more appropriate to suggest a frame of mind. Unfortunately, when I read it, I was feeling down (rough rotations will do that) and I was almost unable to finish the novel due to how upset it made me. However, looking back on it I feel that When Breath Becomes Air has made me more appreciative of my role in life and for the privilege of being a physician. It’s easy to feel bitter or regretful in medical school when you see all of your friends enjoying their 20’s. But, after reading this book, most of the bitterness has melted away. Definitely worth a read. I picked this book up on a whim while visiting a friend in Boston right before medical school. Surprisingly, I think I found this book at the perfect time. Stiff is written by a non-medical author, and is more than you ever thought you wanted to know about dead human bodies. She writes about everything from the history of cadaver usage to rotting corpses used to solve murder cases. The mostly light and informative nature of this book makes it perfect for the summer before medical school. You will gain an insight into cadavers right before you start spending dozens of hours every week cutting one up. I felt like it changed my perspective on anatomy lab for the better, and gave me a new appreciation for the donors who have shaped my medical education. In my opinion, Flowers for Algernon is vastly underappreciated. I can’t believe how many people have not even heard of it! I read the novella version, but I have heard that the short story is also very good if you don’t want to invest as much time. This book follows a man who is mentally disabled (from phenylketonuria if I remember correctly), who undergoes a surgery to increase his intelligence. The hero’s struggle with his evolving relationships and deteriorating condition really highlight the struggles of mental health patients. The psychiatry rotation is usually associated with lighter hours than pretty much every other rotation during third year. I had ample time to read, plus catch up on the other aspects of my life and then some. Flowers for Algernon really helped me empathize with patients suffering from severe mental health issues. Before reading this, I don’t think I could have interacted with a floridly psychotic patient without completely disconnecting with them. I would definitely recommend reading this book during (or right before) your psychiatry rotation. Oliver Sacks is a neurologist who wrote about unique and interesting cases involving the human brain. The cases range from bizarre human behavior changes after trauma, to surgeons with Tourette’s syndrome. His descriptions of patients display a level of compassion that I can only hope to be able to mirror in my future practice. Even if you find a particular case to be boring (which I can’t imagine), you can still feel how invested this man was in his patients. The Man Who Mistook His Wife for a Hat was the first of his books that I read, but there are several others that I have been able to read. You really can’t go wrong with any of them, so pick one and get to it. If possible, I would try to fit this book into your first year winter break. Long months of classroom work can really bog you down, and Oliver Sacks’ works do a great job at rekindling your curiosity and fascination with medicine. When you start to lose your mojo, take a break and read about the huge tumor that turned a man into the perfect Buddhist monk (and Grateful Dead fan). If you’ve spent any time at all looking at medical student/resident/physician forums, you’ve probably heard of the White Coat Investor. He’s an Emergency Physician who has been blogging about finances for doctors for several years. Many financial advisers or other moneymen take advantage of physicians, as our education can leave us with little knowledge on the money subject. Luckily, the WCI does a pretty good job at breaking down various topics that are relevant to new doctors with their first big kid paychecks. As a medical student, dealing with money can seem far away. I had the urge to bury my head in the sand and ignore the increasing loan debt I’ve accumulated. But, with residency looming I’ve had to start catching up on my financial education. The White Coat investor book is a great start. I’d recommend a thorough read right before you start getting paychecks (i.e. 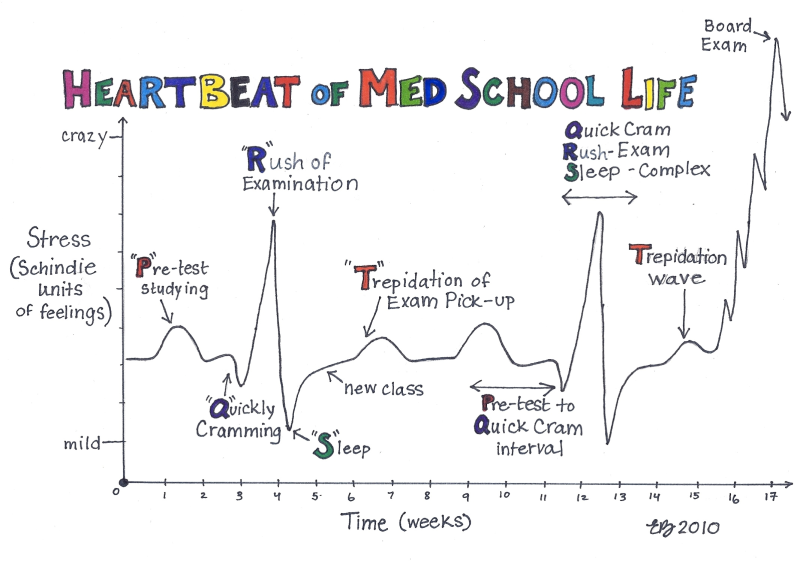 residency), but it does have some values for medical students too. Knowing exactly how your student loans work will pay dividends to you in the future. Just think of it as the personal finance class your school never gave you. Okay, I HAD to throw some Michael Crichton onto this list. I mean, how can you not include a medical school graduate turned science fiction writer on a list of non medical books to read? Even if you haven’t read any of his works, you’d recognize some of the movies that are based on them. Ever heard of Jurassic Park? Yea, that one and many others. The Andromeda Strain is a Sci-Fi novel written in a non-fiction style. It’s full of suspense and is pretty medically consistent. Nothing makes me lose interest in a story more than terrible medical explanations or irregularities. Ever see that movie The Rock, where they had to inject atropine directly into the heart? Yea, that’s a huge movie turn off for me. Luckily, most of Crichton's writings are accurate enough to be plausible. I found the Andromeda Strain to be a very fun read, but I don’t really have a suggestion on when to read it. There’s no purpose behind this recommendation outside of pure enjoyment, so make sure you take the time to enjoy it. You might have an easy block during first year, or an outpatient three-day-a-week elective rotation during fourth year (yes, they do exist). But whenever you have the time, try to pick this one up. Have you read any of these books? What non-medical books would you recommend during medical school? Let us know in the comments!